1) All items in this catalogue are the creations of Borra and are copyright items of Borra and may not be reproduced in part or in whole without prior expressed written consent. 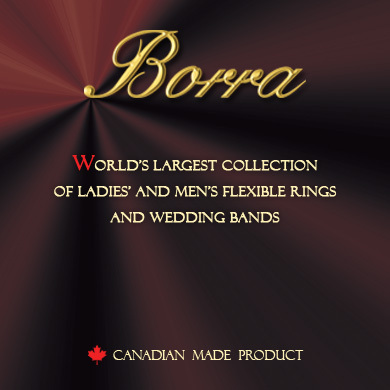 2) The names 'Borra' and 'Borra - Jewellery Par Excellence', and their associated graphic logos are registered trademarks of Borra. 3) All items and prices in the catalogue are subject to change without prior notice. 4) Photos in this catalogue are not shown to scale. 5) Photos shown in the catalogue are priced according to ring sizes and stone sizes listed: this may be replaced for most other stones of the same sizes as listed in the catalogue, based on individual clients' preference of Cut, Colour and Clarity. Therefore, the price of the item may be increased or decreased accordingly. 6) Due to slight variations in individual stones, weights may vary slightly from those listed in the catalogue and will be priced accordingly. 7) Please note that the Flex-Rings and Brooches are not available in 10k gold or platinum. 8) Insured, registered shipping is available worldwide for an additional charge. 9) Every item listed in catalogue (Flex-rings and brooches) is sold with an appraisal prepared by a certified gemologist. 10)Please be aware that certain rings having different model numbers, although similar in appearance, vary in width, weight and the number and sizes of stones and therefore in their total carat weights. Well, what does that mean to me? You may ask, so here is the answer. When exchanging stones in rings with others stones of preferred colour, price or any other reason, this may result in stones having different weights. For example, exchanging a diamond in a ring or a brooch with a sapphire of the same weight, you will have a smaller stone; conversely, exchanging a diamond with a sapphire of the same size will result in a heavier stone. On the other hand, if you were to exchange a diamond with an emerald of the same weight, you would actually get a larger overall stone, but if you were confined to a certain size, within the ring for example, emeralds will weigh less than diamonds. Since stones are sold on a per carat basis, the weight of the stone may therefore be higher or lower depending on the type of stone chosen. Please click the HELP button on any screen to check the charts for sizes and weights of different stones, remember to ensure you're looking at the proper shape chart.